After decades of petrol engine turbochargers being associated with performance, turbocharged engines are now being developed that use forced aspiration to improve fuel economy. Yes, you can still have performance – but with carbon-aware fuel economy numbers that were once the stuff of pipe-dreams. Turbochargers are deceptively simple devices. 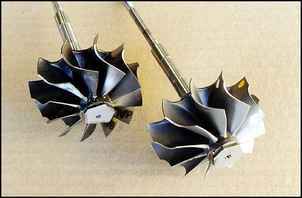 A turbine wheel, capable of withstanding very high temperatures, is placed in the exhaust flow. The flow and heat of the exhaust gases – energy normally wasted – spins the turbine at very high speeds. Connected at the other end of the spinning shaft is a compressor that forces air into the engine. The faster the turbine spins, the faster the compressor spins. Thus the higher the engine power (and so exhaust flow), the more power that in turn can be produced by adding fuel to the extra air being crammed in. A turbocharged engine can breathe a greater mass of air than its swept volume would normally allow. So - if you like - a 2 litre engine can become a 4 litre engine – yet increase in size and weight by only a modest amount. It’s this ‘something for nothing’ outcome that has so driven turbocharged performance. In most turbocharged production cars, the turbo engine will produce 30 – 50 per cent more power than its naturally aspirated brother. 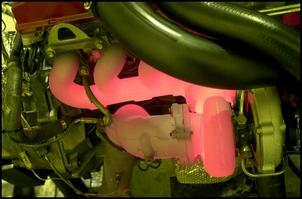 But in aftermarket and racing performance applications, this increase can be 100, 200 or 300 per cent! But what about turbos in economy applications? A turbo engine has the potential to be more economical than a naturally aspirated engine for two reasons. A turbocharged engine is more thermally efficient than a naturally aspirated engine. This is easy to understand when you remember that the turbo uses energy normally wasted out of the exhaust. If you stand behind a car on a dyno as it undergoes a full power run, you’ll be amazed at the force of the gas coming out of the tail-pipe – you can feel it from literally metres behind the car. As it exits the engine, the gas is also hot – up to 800 degrees C – and it is hot because it has energy that can do work. 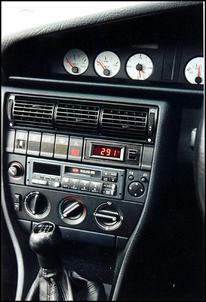 Since a turbo makes use of both the heat and flow, in a turbo car a greater amount of fuel is converted to useful work. So a turbocharged engine is more thermally efficient than a naturally aspirated engine. The other reason that a turbo engine has the ability to more economical relates to the way in which it develops power. In a given naturally aspirated engine, the power developed at each rpm depends on aspects such as valve timing and intake and exhaust manifold tuning. For example, the engine might be ‘tuned’ to develop a lot of power at low revs. However, even with variable valve timing and variable inlet manifolds, a naturally aspirated engine with good bottom-end power is very unlikely to have good top-end power – the compromise to get the good bottom-end power output is simply too great. The reason that good bottom-end power will improve fuel economy is that the car will be able to use low engine revs more of the time. That is, the gearbox will not need to change down, so keeping revs lower. This is important for economy as the frictional losses inside the engine increase rapidly with higher revs – the throttled engine becomes less efficient as revs rise. But low engine revs can only be used if the engine has sufficient power to propel the car at those revs! Of course, fitting a bigger engine will give good power at low revs – but a bigger engine will also have higher internal friction, so there’s no overall gain. Therefore, to gain the best real world economy, what is needed is a small engine (so having low internal friction) running at low revs (again, small internal frictional losses) that develops lots of power at those low revs. And the best way to efficiently give a small engine good low-down power is to turbo it. The two engines are the 2.0 FSI and the 2.0 FSI Turbo. From this table it can be seen that the engines are the same swept volume and use the same bore and stroke. They also both have high pressure direct fuel injection (“FSI”), the same number of cylinders and so on. The naturally aspirated engine uses a compression one ratio higher than the turbo engine and the turbo engine develops 34 per cent more peak power than the naturally aspirated design. So far – apart from the very high compression ratio of the turbo engine – all is as it has been for more than two decades of turbocharging. However, look at the torque output of the turbo engine! 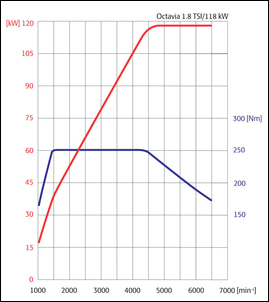 It develops 40 per cent more torque 1700 rpm lower in the rev band! Now people often get confused when talk turns to torque, so let’s forget torque and look at what really matters – power. 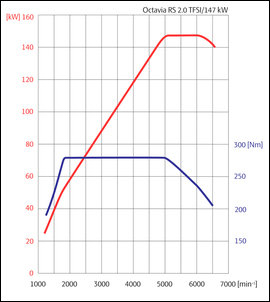 Skoda has been kind enough to release full power and torque graphs for these two engines. ...and this is for the turbocharged engine. Let’s take a look at the power being developed by each engine at low revs. Therefore, when driving the turbo’d car, the engine requires far fewer gear down-changes (either manually or via an auto gearbox) and so stays at lower engine revs more often. Despite having a lot more power at the top end, for economy it is the power available at the bottom-end of the rev range that really matters – and the Turbo 2.0 FSI has it in spades. Unfortunately for this comparison, the two engines aren’t available in Skodas with the same transmissions – the 2.0 FSI has a six-speed auto and the turbo 2.0 FSI a six-speed manual. However, modern auto transmission cars seldom use much more fuel than manual trans cars – indeed, there are some autos that give better fuel economy than manual trans cars. In the Australian government test cycle, the naturally aspirated Skoda 2.0 FSI has a fuel consumption of 8.5 litres/100km while the turbo 2.0 FSI has a tested economy of 8.1 litres/100km! That’s right, the car with more power is also more economical! The CO2 emissions are also as you’d by now expect – 203 grams/kilometre for the naturally aspirated engine and 193 for the turbo. Oh yes, and the turbo 2-litre Skoda gets to 100 km/h in 7.3 seconds versus the naturally aspirated car’s 10.1 seconds! So let’s take a step back. In the comparison shown above of the two 2-litre engines, the turbo engine has better fuel economy, better CO2 emissions, 50 per cent more bottom-end power and 34 per cent more top-end power. In short, it’s better in every respect (except, it must be said, cost to build). Having driven both engines on the road in recent times, the turbo engine is massively better – and in fact in freeway travel, we scored an even greater fuel economy win to the turbo engine than the above official test figures show. But if we’re chasing fuel economy rather than performance, wouldn’t it make more sense to use a smaller engine and then turbocharge it to match the performance (but not the thirst) of the larger naturally aspirated engine? With another engine, the 1.8 litre turbo TSI, that’s exactly what Volkswagen/Skoda have done. So even though it’s a smaller engine, the turbo’d 1.8 easily outperforms the naturally aspirated 2 litre at the critical-for-economy bottom end of the rev range. And of course, it does even better on fuel economy – 7.7 litres/100km and CO2 emissions of 184 grams/kilometre. In fact, in terms of power production, you can see that the engine could probably be smaller still – say, a 1.5 litre turbo. 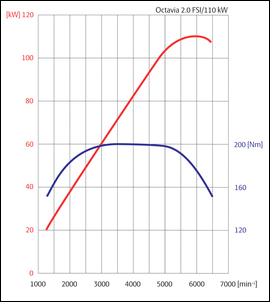 Modern engines using well matched turbos and other technologies like direct fuel injection are capable of exceeding the performance of larger naturally aspirated engines across the full rev range – from just off idle all the way to the redline. Their immense bottom-end power and intrinsically higher thermal efficiency also allows them to develop much better real-world fuel economy. As turbocharging is a technology already well developed and understood, expect to see a lot more turbocharged, downsized petrol engines performing for all the world like big engines – but without the thirst and emissions production. As part of the downsizing concept for the engines of the future, exhaust gas turbochargers are one of the key technologies for achieving a sustained cut in fuel consumption and CO2 emissions. The use of exhaust gas turbochargers is already common in modern diesel engines, and they are expected to become more prevalent in gasoline engines as well. This also calls for more widespread use of advanced injection technologies. This is an area in which Bosch already occupies a globally leading position, both with gasoline direct injection and with common-rail technology for diesel engines. MAHLE has many years of experience in the development and manufacture of high temperature-resistant turbocharger components. In addition, its subsidiary MAHLE Powertrain specializes in the development, design, and application of turbocharged engines. "This joint venture will now allow us to offer our customers from a single source a complete product portfolio for reducing fuel consumption and emissions," said Dr.-Ing. Bernd Bohr, chairman of the Bosch Automotive Group.